It just occurred to me that most of the recipes I’ve been posting involve cilantro and spice. What can I say—I love spicy foods and I love cilantro! But I know not everybody does, so I promise to start mixing it up a little…after today. Today I need to share yet another cilantro/spice favorite because it’s the perfect side dish to add to your BBQ menu, whether you’re grilling up hotdogs and hamburgers at home or heading to a neighborhood potluck. 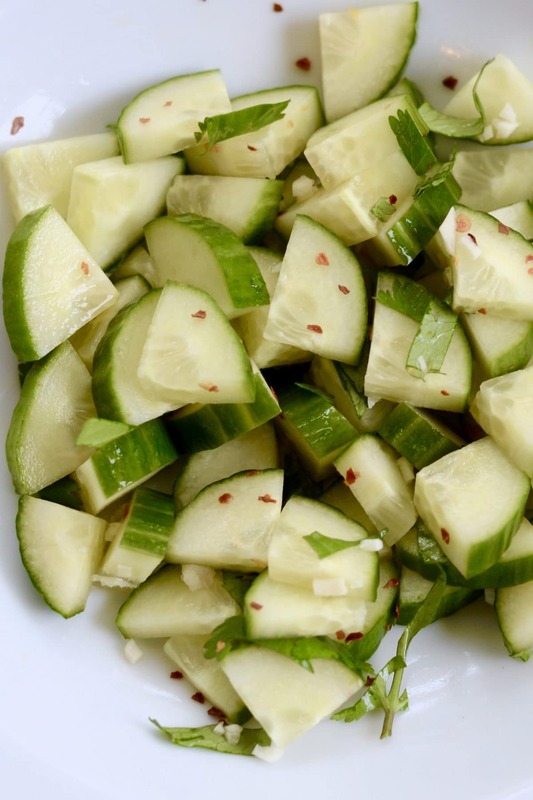 My brother threw this spicy cucumber salad together when we were grilling last summer, and I could not stop eating it. Unlike a lot of things I cannot stop eating, this recipe is actually healthy! 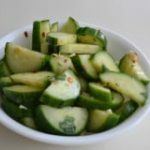 The garlic, vinegar, and red pepper flakes make the cucumbers taste sort of like spicy pickles, but fresher and without all of the crazy sodium. Even better, this recipe only requires five simple ingredients and can be made in mere minutes. The key to making this cucumber salad extra delicious is using an English cucumber (the really long kind that comes wrapped in plastic). They have a great crunch and don’t need to be peeled, so they make this dish that much better AND faster. You simply toss the chopped cucumber together with the other ingredients and keep it in the fridge until you’re ready to serve. You don’t want to make it too far in advance or the cucumbers will start to get soggy, but if you make it an hour or two ahead, the flavors will have plenty of time to mingle, and the salad will come out cool, crunchy and delicious. The perfect easy side dish for BBQ season. Slice the cucumber lengthwise and chop into 1/4" slices. 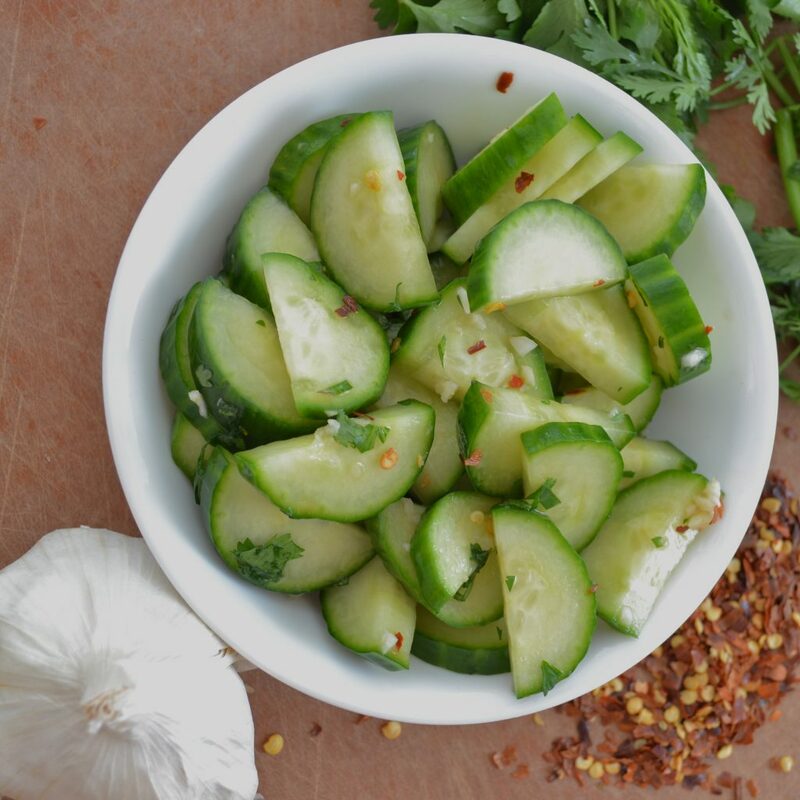 Put the cucumber in a bowl and toss with the vinegar, garlic, cilantro, and red pepper flakes. Add salt to taste. Refrigerate until ready to serve. 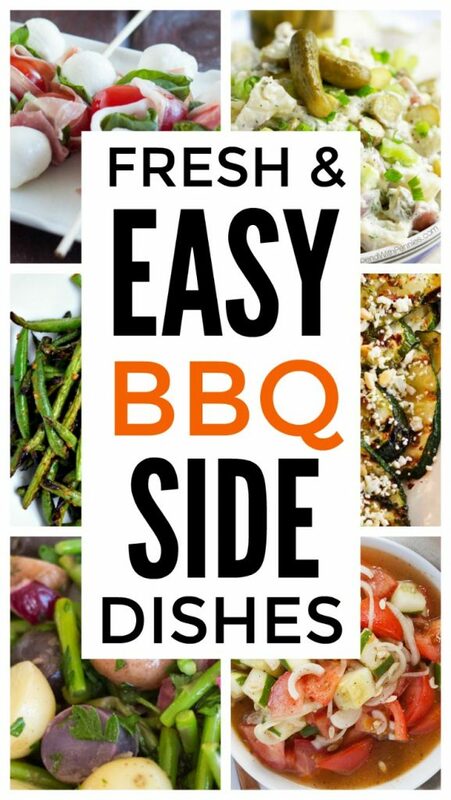 For more BBQ friendly recipes, check out my round-up of Easy BBQ Side Dishes. That looks amazing! 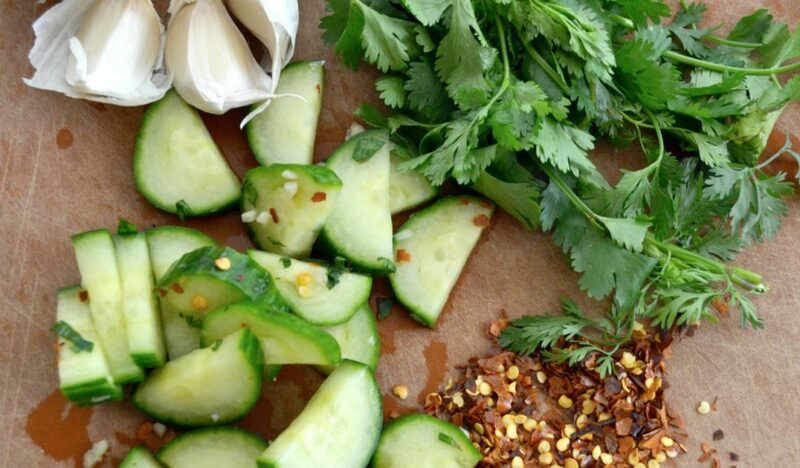 I am also a fan of cilantro and spice and can’t wait to put your recipe to good use. My only problem will be saving enough cilantro for the cucumbers since I make fresh salsa.